The following customer information site to inform and instruct our legal obligations . We will inform you about all matters relating to the conclusion of the contract based on your order and its processing . If you are acting as a consumer , you can revoke your contract declaration within one month without giving reasons in writing ( eg letter, fax, email) or by returning the goods. These Conditions , we want you to be in writing . The period begins on the day after you received the goods and the revocation in writing . The revocation period is sufficient to send the revocation or the goods. In case of an effective withdrawal, the mutually received benefits are to be returned and any benefits ( eg interest ) surrendered. Can you give us the goods in whole or in part, or only return them in an impaired condition , you must pay us compensation for the value. This does not apply if the deterioration of the goods to their examination - as would have been you in a retail store , or the intended use of the goods is due . Transportable items are to be returned at our risk. Not parcel things do you pick . You have to bear the cost of returning the goods if the delivered goods ordered corresponds and if the price of the returned goods does not exceed an amount of 40 euros or if you are at a higher price the thing at the time of the revocation yet the payment or a contractually have provided partial payment . Otherwise the return is free for you. Obligations to reimburse payments must be fulfilled within 30 days of the declaration of revocation . We use the personal data provided by them for the purpose of ordering the goods exclusively for the fulfillment and completion of the contract . We make our products with Deutsche Post and the German parcel service ( DPD) supply . This has been informed of your data to the extent necessary for the delivery of the goods. Otherwise we will not pass on your data to third parties. With the completion of this contract, including the full payment of the agreed purchase price , your data must be kept for tax purposes , locked. This data is available for further use is no longer available . Otherwise your data will be deleted, unless you have expressly consented to the further processing and use of your data. In this case, you can check , change or delete the stored data with us . You may withdraw your consent at any time . 1 Partial deliveries are permissible . If the delivery date , the buyer is entitled to rescind the contract or cancel the pending part of the business , if he has previously made ​​a reasonable grace period . Cancellation of contract by the buyer is not possible with special designs. Unforeseen obstacles to delivery , such as force majeure , breakdowns in their own company or in the operation of the suppliers or manufacturers , strikes , transportation difficulties, etc. , release us from our obligation to deliver . Damage claims by the purchaser due to delayed delivery or non-performance shall be excluded in any case . Requirement for delivery is the absolute creditworthiness of the buyer. If, after the conclusion of the contract doubt , we are entitled to withdraw from the contract. Lack of credit is deemed to exist if the buyer does not pay an overdue bill , despite a reminder . 2 Returns, regardless of the reason , must always be announced in advance by telephone , this will be decided from our side about the cost of return transportation . 3 To offset our valid on the day of purchase prices come . 4 The purchaser shall immediately , but no later than recite written complaints within 10 days of receipt of the goods. Arrived Damaged shipments are primarily responsible for the carrier ( Post Office, UPS , etc.) to complain . Only when this has been found at fault on our part, a claim is allowed with us . Our liability is canceled by arbitrarily tampering of the product. In case of justified complaints, the buyer is only entitled to replacement or repair , at our discretion . Direct or indirect damage is not replaced. Claims such as conversion and reduction , refund of wages , penalties , etc. are excluded . In case of justified complaints, we are liable for defects only if and to the extent we have warranty claims against the eligible supplier or manufacturer . Further claims for damages of any kind are excluded. 5 Warranty is provided for our products according to the law applicable in Germany . Products that are not approved for use on public roads that serve exclusively to racing on non-public routes , and are excluded from the guarantee. 6 When using our products in vehicles that are in the public and non- public roads , such as Sports events are approved , the purchaser 's responsibility to ensure that all changes and conversions in accordance with the legal provisions are entered in the vehicle documents. 8 The legal invalidity of part of the above conditions is on the validity of all other same without influence. The BPX-Key Bunny Power Tuning Module/ASA Espeed Tuning/badass Tuning may only be used on privately owned areas and/or routes. The use of the BPX-Key Bunny Power Tuning Module/ASA Espeed Tuning/badass Tuning manipulates the factory set, maximum governed speed of your Bosch pedelec (pedal electric bicycle). This change to the governed speed limit is not allowed on public roads. No liability is assumed by the seller or manufacturer of the BPX-Key Bunny Power Tuning Module/ASA Espeed Tuning/badass Tuning for any current or future incidents that may result in damage to property and/or persons from any improper installation/removal and/or improper use. The user of the BPX-Key Bunny Power Tuning Module assumes all liabilities and uses the product at his/her own risk! 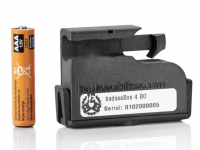 The warranty of your eBike/pedelec can be voided by the installation and use of the BPX-Key Bunny Power Tuning Module/ASA Espeed Tuning/badass Tuning. The manufacturer of the eBike/pedelec and the individual manufacturers of the component parts (i.e. drive unit) may void their factory warranties if the BPX-Key Bunny Power Tuning Module/ASA Espeed Tuning/badass Tuning is installed.